Felix Mendelssohn(-Barthody), composer, was born on February 3, 1809 in Hamburg, Germany and died on November 4, 1847 in Leipzig, Germany. Despite his relatively short life, Mendelssohn composed a large amount of music including Concertos (3 for Piano, 2 for two Pianos, 1 for Violin & Piano, and 2 for Violin - the second one being the famous Violin Concerto in E Minor); several Overtures; 13 Sinfonia (String Symphonies) and 5 Symphonies. He met Clarinet virtuoso Heinrich Baermann (1784-1847) in 1829 and became good friends. 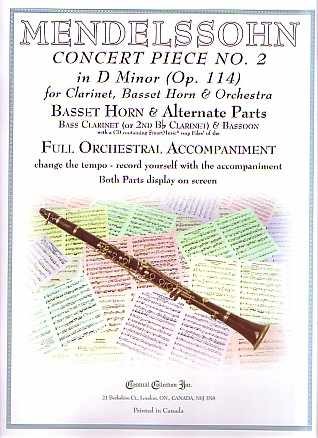 Both Concert Piece No. 1 in F Minor (Op. 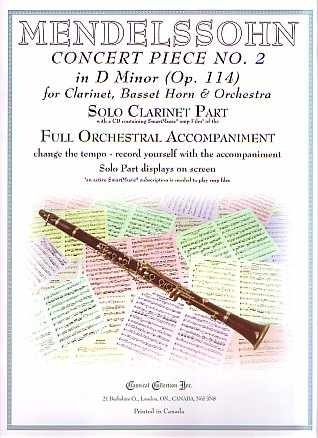 113) & Concert Piece No. 2 in D Minor (Op. 114) were composed for Clarinet, Basset Horn (in F) and Piano in December 1832 and first performed in January 1833 with Baermann on Clarinet, his son Carl (1811-1885) on Basset Horn and Mendelssohn on Piano. He orchestrated Concert Piece No. 1 later that year but never did get around to orchestrating Concert Piece No. 2. It was eventually orchestrated by Carl Baermann, now thought to be Heinrich’s Bassoonist brother Carl (1782-1842), rather than his son. - 2/2, Presto (half = 116); 6/8, Andante (eighth = 138); 2/4, Allegretto grazioso (quarter = 108).